Memorial: Dawlish Memorial Inscription LARCOMBE F.G. L/CORPL. 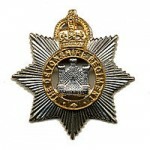 DEVON REGT. It is not known when Francis enlisted nor where, neither do Medal Rolls Index Cards give the date of his entry into France. It might be supposed that he joined when conscription took effect early in 1916, since the Death Grant paid to his widow was £1.17s.2d, a modest sum. In March 1917 the Germans were falling back to the newer and deeply defended Hindenburg Line. General Haig gave orders for a general advance all along the line to start on March 17th. This was conducted with caution as the retreating Germans had left booby traps and hidden machine gun nests to delay the pursuing troops. After a long period of trench warfare the open battlefield was a new experience. The 2nd Devons had another new experience encountering German cavalry, which was eventually driven back. On the 25th there was a night attack on the village of Lieramont which was defended by thick wire and infantry. Two days later cavalry patrols found Lieramont evacuated and the 2nd Devons moved up to occupy it. The enemy was beginning to stiffen resistance and an attack on Heudicourt on the 29th-30th March failed. A fresh assault was ordered on the 30th and the 2nd Devons followed a barrage that lifted at 4.15pm to attack from the south. There was sharp fighting with rifle and machine-gun resistance, but by 6.45pm all objectives had been secured. Francis George Larcombe is shown to have been killed in action on the 30th March. Francis George Larcombe was one of four children of John Clarke and Georgiana Mary Larcombe. John C Larcombe (1858-1909) was a Gamekeeper, born in Nettlecombe, Somerset, and Georgiana (nee Wood) (1859-1941 )was a Certificated Schoolmistress born in Chepstow, Monmouthshire. They had married in 1881 (Williton district, 1881, July-Sept, Vol 5c, p 413). In 1891 John and Georgiana Larcombe were living at a cottage in Lowton, Pitminster, Somerset with two children, Annie C (1882- ) and Francis G (1884-1917). In the following year Henry John Larcombe was born and in 1895 they had another daughter, Laura Mary Larcombe. In 1901 George was 17 and a cowherd on Slade Farm, Dulverton. Francis George Larcombe married Ellen Susan Millman in 1909 at St Thomas the Martyr, Exeter (St Thomas district, July- Sept 1909, Vol 5b, p116). Ellen came from a large Exeter family living in St Thomas and was the daughter of Frederick J and Ellen M Millman. Francis was Head Gamekeeper of the Luscombe Estate, Dawlish and in 1911 they were recorded as living at Beech Grove Lodge, Dawlish with their first child, Ellen (1910- ). They had a second child, John (Birth record 1912, July- Sept, Newton Abbot district, vol 5b, p 158). He later married Madeline Sumner (1913-1974) in Frome, Somerset in 1940 and died in that district in 1990, aged 78. Francis George Larcombe was a Freemason and member of the Salem Lodge in Barton Terrace, Dawlish. He is remembered there on their Roll of Honour.